Today I am showing you what I think is a significantly important painting in the history of Modern Art. Nocturne in Black and Gold, The Falling Rocket, painted in 1875, broke visual ground as a precursor to abstract, or non-representational art. James Abbott McNiell Whistler (1834 -1903) painted this picture using an abstracted style; a completely different style from any accepted, academic painting of the time. Whistler believed in “art for art sake”, or that art need serve no other purpose than beauty alone. Art academies began to form in Europe in the 18th century. These academies instructed and encouraged artists in the visual arts. 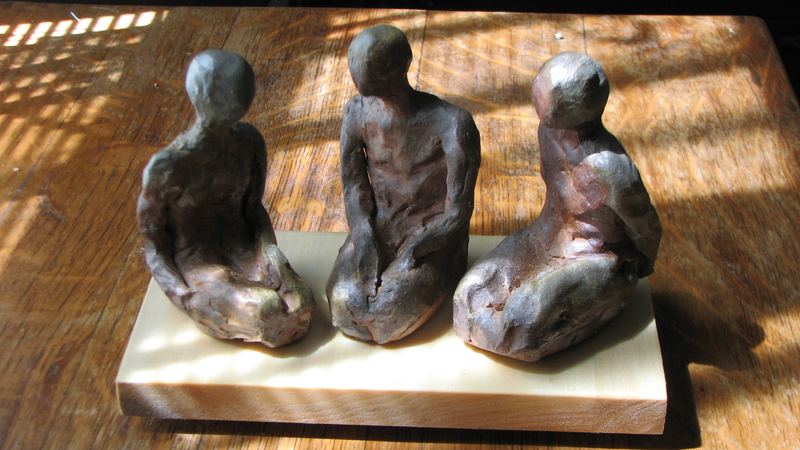 They held exhibitions of juried works, called ‘Salons’ and were very influential in molding the public’s taste of art. As time went on, artists who did not agree with the confines of academic art began to publicly display art that broke the rules. Nocturne in Black and Gold, The Falling Rocket is pinnacle in challenging the status of accepted artwork. A leading art critic named John Ruskin was deeply disturbed by Whistler’s work and thought this piece looked unfinished and devoid of moral purpose. He publicly criticized Whistler’s work and Whistler in turn sued Ruskin. Whistler’s case against Ruskin was a defining moment as he publically justified the value of abstracted work by stating that a painting has no need for an identifiable subject matter and can be solely about beauty and devoid of a moral message. Whistler won the case, but went bankrupt due to all of the legal fees. From this time forward, I believe the scope of ‘what is art?’ began to expand and gave the artist more power to express him or herself beyond the imposed academic rules. Categories: Art History, Uncategorized | Tags: 18th century art academies, James Whistler, John Ruskin, Nocturne in Black and Gold | Permalink. The best way to practice our skills and stay inspired is to take our studio with us! This means finding creative solutions to carrying our art supplies with us wherever we go. It seems I always have drawing pencils and erasers tucked into my pockets, my purse, and even in the drink holder of my car. 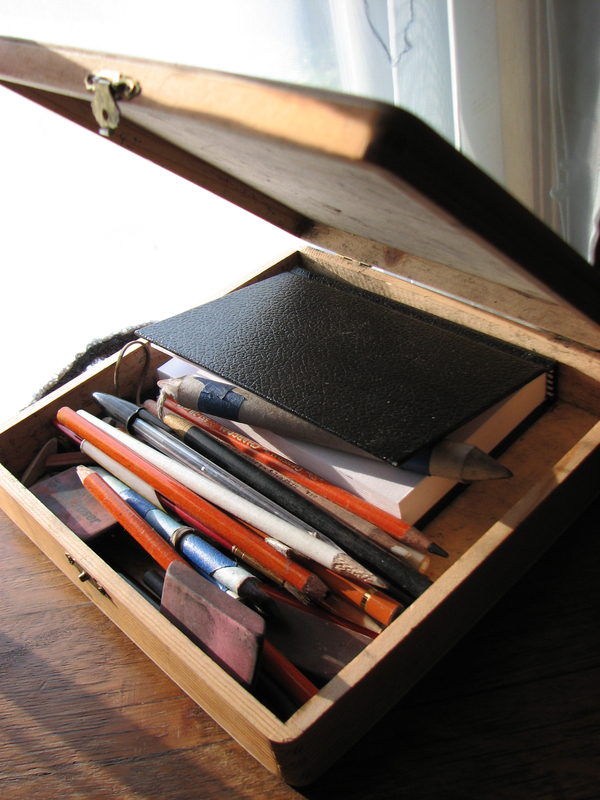 A while back I found a small, wooden box at a craft supply store that was just the right size for carrying a handful of pencils, paint brushes, paints tubes and pens along with a small size sketch book. The wooden box is small enough to carry in a larger size purse so it travels with me on a daily basis. Another idea I have is to sew a cloth strip about 12 inches long and 8 inches wide with two string ties. Pencils and such can be rolled up in the strip and the ties can hold it closed. 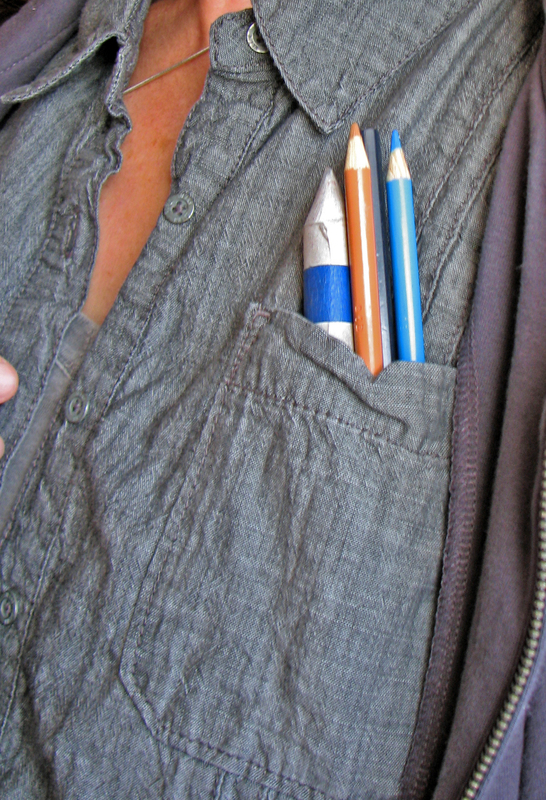 A simple school pencil pouch dedicated to your supplies would work as well. I have seen large cloth or plastic pouches at office supply stores that could hold a small sketch book as well. So if this interests you, I encourage you to find a way to make a ‘pocket studio’. Welcome to my art blogging site, Be It Art, where I’ll share with you my thoughts about ‘all things art’. How about some book reviews? I’m always looking for an art book, whether about technique, projects, art theory or about an interesting artist….I’ll share what I have read. To all who love ‘all things art’ ……….